We can learn from the ultimate in natural light and ventilation. This sketchbook is from my second trip to Hawaii. The island of Hawaii, also called the Big Island, is home to the Four Seasons Resort Hualalai at historic Ka’upulehu. My wife and I were fortunate to spend our honeymoon on the exclusive Kona-Kohala coast, at this incredible resort. I drew this sketch sitting on our villa terrace, with the ocean to my back, and the reflection in the sliding glass doors includes the ocean views. The ceiling fan at center inspired me years later to put five-speed, reversible Energy Star-rated fans in our home. The idea is to be able to create airflow to cool the house in the summer by lifting the warm air up and then reverse the blades on the winter days to push the heat down. The indoor-outdoor living experience in Hawaii is extraordinary, and it frees up design opportunities as well to integrate indigenous natural materials. Locally sourced materials are key to sustainability. On remote islands, going local is often more of a requirement than an option due to the high cost of importing materials from the mainland. As an example, palm trees have served as local sources of construction material, food, and drink since the first islanders set foot on the beach. The meat and the milk from coconuts also come with a convenient drinking vessel when you slice off the top. Plus, the palm fronds work for roofing as well as woven carrying bags and clothing in survival mode. This “use it all” capability reminds me of the way that Native Americans leveraged every element of the bison to use from housing to tools. This is a wider view of the Hawaii bungalow. 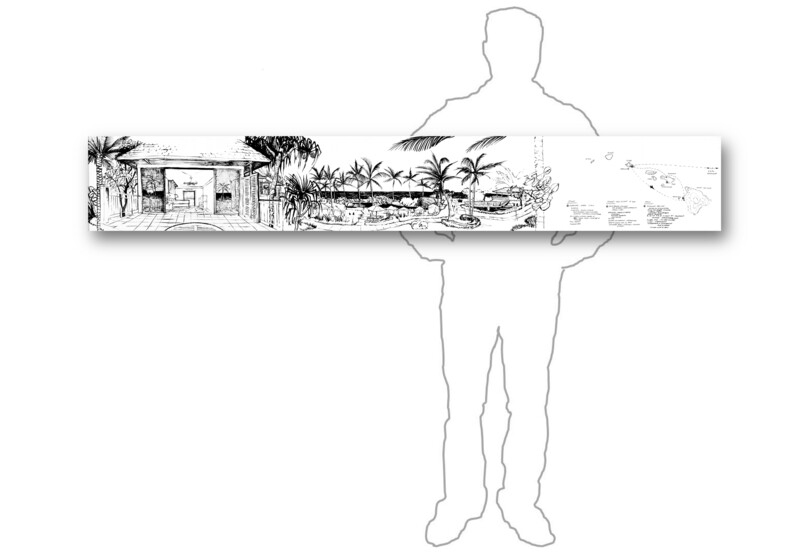 The figure outline in this image is for scale to illustrate the size of the fold-out field drawing. The descriptions of certain key elements and insights are included with the accompanying drawings in this section. Author and illustrator: Charlie Szoradi is an architect, inventor, and the CEO of Independence LED Lighting. He writes about many other topics related to Hawaii bungalow design and island life through his extensive travels around the world. If you have found this posting online, it is an excerpt from Mr. Szoradi’s book Learn from Looking that served as the inspiring seed content for this drawing share resource. For additional drawings and insights on natural light and Hawaii bungalow materials, we hope that you enjoy exploring LearnfromLooking.com. You can search via general terms such as sustainability as well as narrower terms such as indigenous natural materials, Hawaii bungalow, and natural ventilation.